with the left angle of the mandible. Considerations were bony callus secondary to trauma versus a calcified hematoma. ner Syndrome was initiated. Genetic testing was subsequently positive for Familial Adenomatous Polyposis. presentat i on on imagi ng. tween ages 30 to 60 years . cysts, leiomyomas, lipomas, and desmoid tumors . in the case presented above . 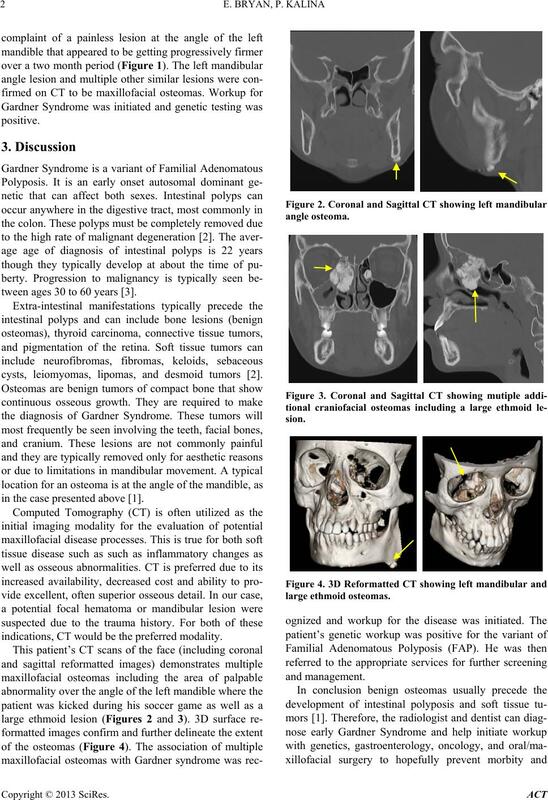 indications, CT would be the preferred modality. mortality associated with the disease. A. 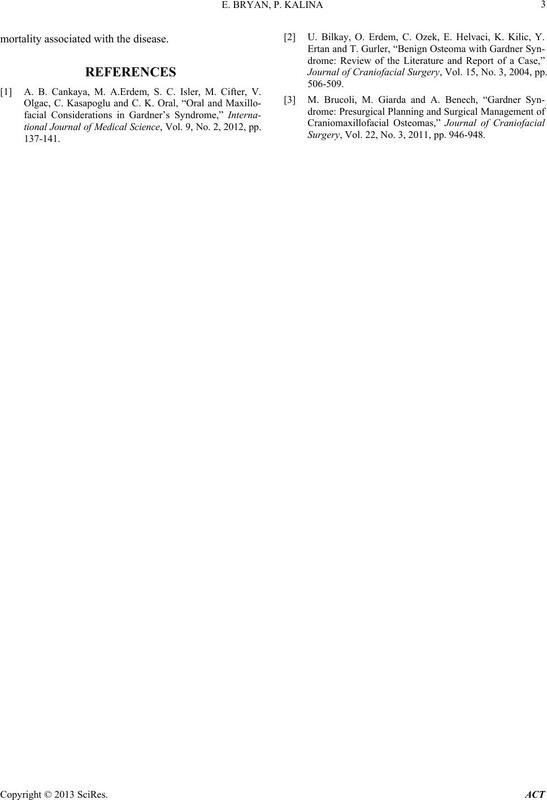 B. Cankaya, M. A.Erdem, S. C. Isler, M. Cifter, V.
tional Journal of Medical Science, Vol. 9, No. 2, 2012, pp. U. Bilkay, O. Erdem, C. Ozek, E. Helvaci, K. Kilic, Y. 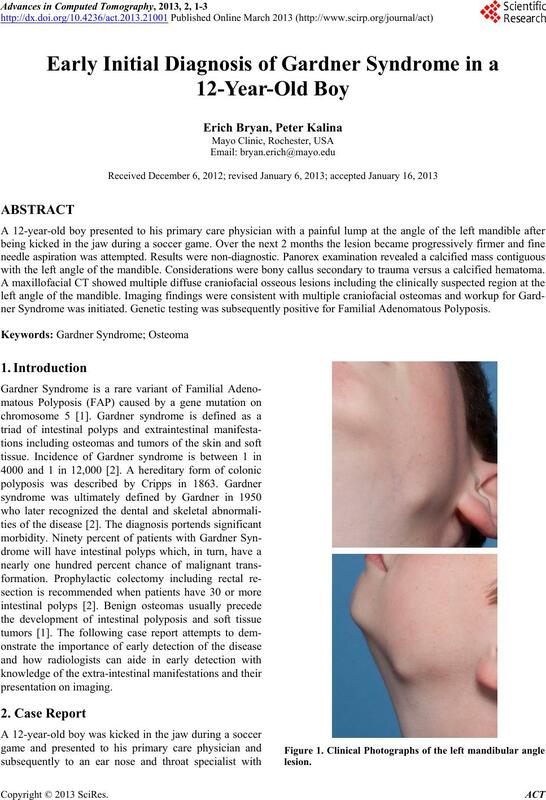 Journal of Craniofacial Surgery, Vol. 15, No. 3, 2004, pp. Surgery, Vol. 22, No. 3, 2011, pp. 946-948.